For almost 60 years Robert Creeley wrote short, smoldering poems that generation after generation have studied for their condensed insights into what it was like to experience those enormous decades, from the 1950s through the ’60s, ’70s, ’80s, ’90s and into a new millennium. His poems, with their wound-steel tension, have also offered clues on how to live a creative life while “walking the line” of love and family. Creeley’s impact on post World War 2, and postmodern digital-age literature was enormous. Creeley loved conversation, and was always willing to have long chats with his many friends. "I am always talking," he noted in one of his most famous brief poems, "I Know a Man," which closes this album. He had a distinctive voice, a bit of Jimmy Stewart, and a bit of New England bard, mixed in with a watery echo that fits in beautifully with the watery themes of some of the poems on Really Creeley, such as "Death of Venus," or "Just Friends" from Creeley’s epochal book For Love. His was what William Blake described as "the Voice of the Bard." Those who knew him were struck by his hunger for precision. He liked to write his poetry while listening to music. He once noted in a lecture how the type and quality of music affected the writing. “The typewriter,” he said, "the insistence of music, rhythm, something with a strong rhythmic character, not too low, subtle enough so that you can always go back to it... and paper." He knew precisely what kind of paper he wanted for writing poetry. He wanted imprintable, semi-soft paper. “I hate a hard paper,” said Bob Creeley at the 1963 Vancouver Poetry Conference. He was always experimental. In the 1990s, he took to the internet like taking to jazz in 1946. He collaborated with artists such as Francesco Clemente, writing poems to accompany paintings; he performed with musical groups occasionally, and not long before he passed away published a book of his internet writings, Day Book of a Virtual Poet. He kept strong friendships throughout his life. His desk wherever he lived was always stacked with the recent letters of friends. It began early. In 1950 William Carlos Williams urged Charles Olson to get in touch with a young poet named Robert Creeley, who was living then as a poultry farmer in New Hampshire and doing a weekly literary show on a radio station in Portsmouth. The Creeley-Olson friendship and correspondence became the stuff of literary legend. In the early 1950s, Olson would read frequently from Creeley’s letters and manuscripts in classes at Black Mountain College. Not long before Creeley came to teach at Black Mountain, he and Olson planned and began publishing an important literary magazine of the era, The Black Mountain Review. Creeley became the editor of BMR, and put together seven issues from Mallorca, Black Mountain College, Albuquerque and San Francisco— wherever he was living. After a stint Black Mountain College, Bob Creeley then went to San Francisco in 1956 in part to collect manuscripts and make contacts for the famous Beat Generation issue of the Black Mountain Review. It was there in San Francisco that he met Jack Kerouac, and became close with Allen Ginsberg. Creeley even helped type the stencils for the now very valuable mimeographed edition of “Howl.” By the year that On the Road was Published, 1957, Creeley had moved to New Mexico to take a teaching job, and had met his second wife, Bobbie Louise Hawkins. In a burst of creativity during the next few years, Creeley published For Love, and made a name as a novelist and writer of short stories. He was close to the Best Minds of his generation— and was a correspondent and confidant of many major writers. Creeley was always loyal to the friends he made. After Olson’s death in 1970, Creeley helped keep alive the works, impact and legacy of the bard of Gloucester. For many years, Creeley was a much-respected and honored professor, holding the Gray Chair in Literature at SUNY Buffalo, and in his final years was a professor at Brown University in Providence. He was the New York State Poet in the 1990s, and won the very prestigious Bollingen Prize in 1999. His poems were always intense and usually very personal. His poems and public persona invited an inspection of his literary era. He took stances on public issues. He is one of the few poets who actually wrote a poem promoting national health care, and often spoke out against the stupid wars of aggression that his country seemed always to promote. He was a fiercely loyal family man, yet even as much as he cherished his family and children, he had the urge to wander and indeed he was one of the most well-traveled of poets. In one sense, he was a classic New England poet, in the tradition of John Greenleaf Whittier or Robert Frost, but he was also a poet of the Southwest, and loved New Mexico where for years he owned a house in Placitas. Thanks to the jet plane, and constant travels to recite his verse, he became— like other American poets such as Allen Ginsberg— a bard of the Nation entire. His admirers often wondered, "How does he do it?" How did these brief but very intense poems, packed with meaning and insight, come forth from Robert Creeley? Someone, I heard, once asked why he wrote poems? "Because I can," is what legend says was his answer. The impact of Creeley’s poetry keeps on coming, even after you’ve read a poem many times. In the preface to For Love there is a paragraph that taught a lesson to my generation of writers: "It seems to me, now, that I know less of these poems than will a reader, at least the reader for whom — if I write for anyone — I have written. How much I should like to please! It is a constant concern." One thing that struck me, listening to this album, was how much Creeley respected his line breaks. Many poets when they recite do not pay much attention to their line breaks. In the gathering of recitations on this album, you get a sense of his intensity and his subtly-delivered directness, and how precisely he honored the ends of lines. In the mid-1980s Michael Minzer began producing poetry albums and later CDs for his label, Paris Records. Among them was the well-received CD, The Lion for Real, for which a number of composers created music to go with Allen Ginsberg’s recitation of some of his major shorter poems. In 1988, Robert Creeley came to Dallas for a reading at the library, and was approached by Minzer to record some of his poetry during his visit. Creeley agreed and Minzer brought him into a recording studio. The result was an astounding time-slice of the essence of Creeley. Over half of the poems Creeley reads on this album are from his 1962 book, For Love, which settled his reputation as a modern master. Other poems are from books from the 1970s and early ’80s. Subsequently, Minzer commissioned composer and recording artist Ralph Carney to create and record musical accompaniment to the poems. Carney had worked on Ginsberg’s The Lion for Real, and has had a distinguished career as a composer and recording artist. The music Carney recorded for the twenty Creeley poems on this album has amazing moments, and provides sonic punctuation to the performances of Creeley, in which the words are like elegant chips of stone that are easily received by the listener. Creeley’s brief introductions, such as the one on this album prefacing the powerful “For My Mother,” written in 1972 for Genevieve Jules Creeley, give the listener even more entrance. Carney brought to this project his renowned skills at a number of instruments, and his deftness at the composition of melody and then recording layers of his creations into tapestries of sound that can rock, or lift the poem with a jolt of sax and bass, or even to provide the slight slosh of the water that Creeley described in "Just Friends,"
if you look long enough. The strict marriage of brilliant sequences of words and music is its own kind of printed page. It prints itself in the mind through the ear. 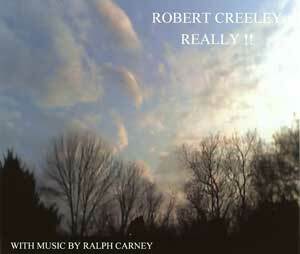 All you need is free time and an alert mind for Robert Creeley and Ralph Carney to give you some thrills. Each poem suggests music, and Carney has not let us down. There are drums, saxophone, guitar, bass, and a number of other instruments. I was struck by the strings and slightly apprehensive drums, for instance, in “Things to Do in Tokyo,” or the synth that sounds like harmony singing on “The Dishonest Mailman,” or the excellent clarinet part in “Just Friends,” — these are just a few of the fine instrumental embellishments that add pleasure to Really Creeley. The point is that this album is very much worth listening to and savoring. And listening to again. You might try getting a copy of For Love, for instance, and reading the poems as Creeley speaks them. I bet you’ll find it fun, as you catch the subtle, half-second-long line breaks that Creeley, in his precision, makes sure you perceive. And the music that Ralph Carney has conjured to bring the bard alive and smiling into your ears.